Spring has sprung and it’s time to get out there and enjoy the outdoors. I mean really enjoy the outdoors. With locals like Beth Evans-Ramos it is not difficult to be inspired. She is the creator and cocktail enthusiast behind Mama (Beth) Knows Her Cocktails. Recently, Molbaks hosted Beth as a speaker to impart her wisdom on all things garden and cocktails. Beth demonstrated how to infuse water with herbs, flowers, tangerine peels and bitters. And then she provided many examples and recipes on how to transport the garden to cocktails by either infusing booze or adding bitters or both. So inspired by Beth for St. Patrick’s day I infused Irish Whiskey with Vanilla. 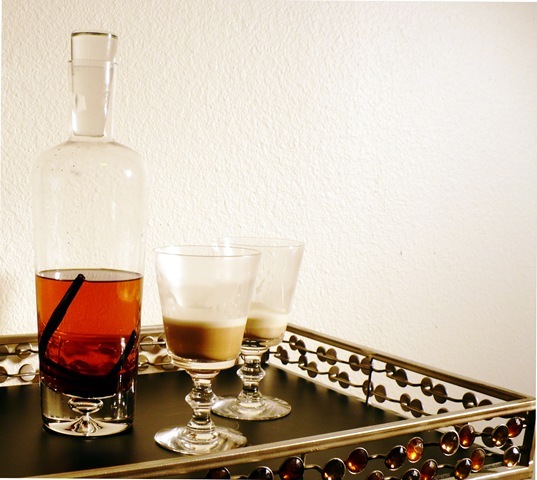 Click here for the Vanilla infused Irish Coffee recipe from Marx Foods. It was fantastic and a drink to serve anytime especially as spring sheds it’s cold wintery like days. Along with infusing booze many people know, I’m just learning, that bitters are the rage amongst Seattle foodies. Bitters are a magical elixir of spirits, spices, plants, herbs (that can be found in any garden) and fruit fermented together for a couple of weeks and added to your vice of choice. Click here for Beth’s Cherry Bitters recipe. and of course check out Beth’s blog at Mama (Beth) Knows Her Cocktails.